Noah is one of our youngest supporters. His commitment to honor our Veterans is evident at every Welcome Home Ceremony he attends. We asked Noah to share a few words about why he has chosen to give his time to applaud The Greatest Generation. Noah, friend of our Austin WWII Veterans! Noah mentioned that he was overcome with emotion as he welcomes home our Veterans; our Veterans are also overcome with emotion as they see our community honor their service and sacrifice. WWII Veteran Marvin Kanter, Noah’s neighbor and friend, shared throughout this 3 minute video, his appreciation and surprise that people in his community thought of him and his fellow Veterans. 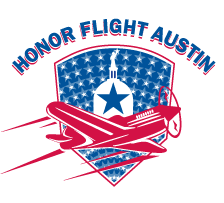 If you’d like to volunteer to attend our Welcome Home Ceremony at Austin Bergstrom International Airport, we post our upcoming events on the Honor Flight Austin Facebook Page.